These are a necessary evil. We've tried a few different models and these seem to work the best. At best, folks find them unruly. At worst, they end up carrying both the kayak and cart over the trail. There is a trick to strapping them to your kayak, but the debate is still open whether to push or pull. Please note, the carrying capacity of the portage wheels isn't much more than most kayaks weigh. Our heavy polyethylene boats don't leave much wiggle room. Please do not use your kayak as a wheelbarrow- this may break the portage cart, and will definitely put a huge dent in the kayak. I only recommend using these wheels if you're portaging the touring kayak solo. 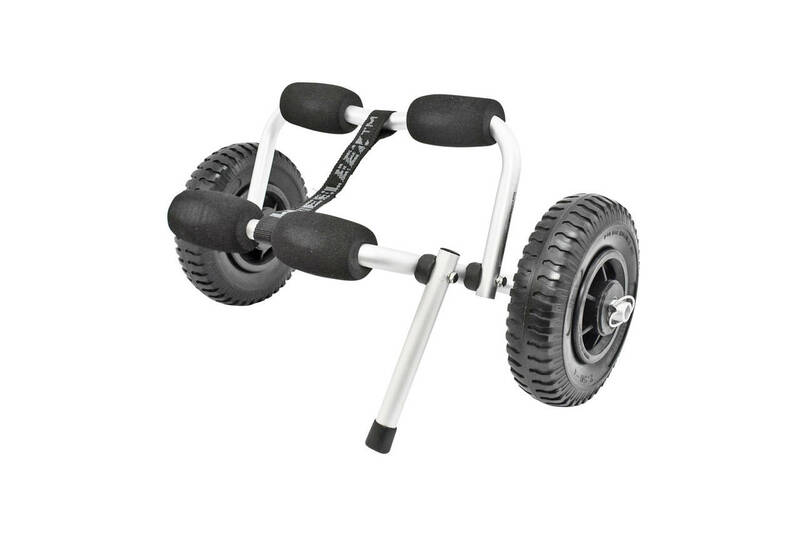 This rental includes the cart and two straps for attaching the wheels to your kayak.